Isadora Duncan was a dancer and choreographer who advocated movement inspired by natural forms and rhythms. As a pioneer of modern dance, she was opposed to the rigid and formal structures of traditional ballet; her style was influenced by ancient Greek sculpture, nature, and the writings of Nietzsche. Her barefoot dancing had a tremendous impact in performances throughout Europe, the United States, and Russia, where Duncan also established a number of schools. Her life was marked by tragedy: her two children died in an automobile accident and many years later Duncan died by strangulation when the scarf she was wearing became stuck in the wheels of her speeding car. Her autobiography, My Life (1927), was published posthumously. Unknown artist. 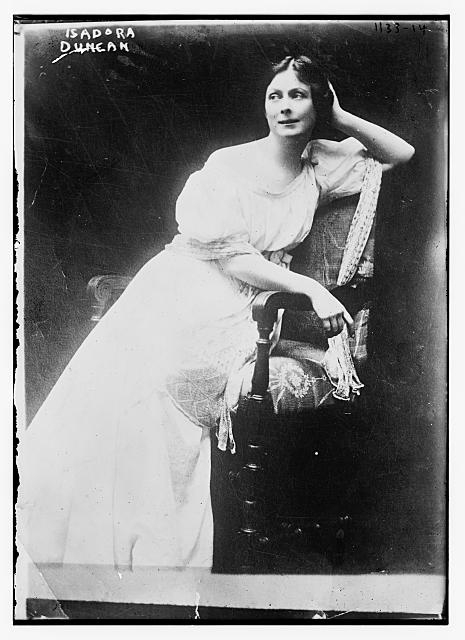 Isadora Duncan, n.d. Library of Congress, Prints and Photographs Division, Washington, D.C.